Keep onions far, far away from your little one. Although onions may seem like an everyday, harmless food to you, that in no ways means they are safe for your cutie. To cats, onions possess an extremely high level of toxicity and can in some cases even be deadly. Keep onions away from cats, no matter what. 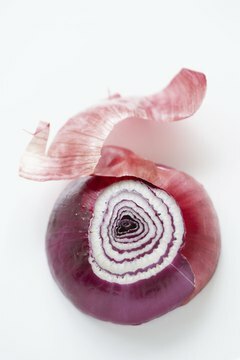 According to the ASPCA, onions are of high toxicity to cats, along with dogs and horses. The toxic factor of onions is caused by the presence of the chemical N-propyl disulfide, to which felines are especially affected, even more so than canines. Onions themselves aren't the only things that are potentially poisonous to felines. Similar root vegetables can also be very harmful, including leeks, chives, scallions and garlic. Onion is toxic to cats no matter what the form. Whether an onion is chopped up and fresh or in dried powder form as a seasoning, it can bring upon dangerous consequences in cats. No matter how adorable your kitty may look as she pleads with her eyes for a bite of your garden salad, do not give in under any circumstances. Onion toxicity is serious business in the feline world, so do not take the threat lightly. Your fluffball's health is counting on you, remember. If you are worried for whatever reason that your precious pet may be experiencing onion poisoning, be aware of key signs including overall feelings of weakness, diarrhea, throwing up, panting, wheezing, coughing, rapid heart rate, anemia and bloody urine. If your cat displays even the slightest sign of any of these dangerous symptoms, do not hesitate for even one second to get her emergency veterinary attention. If onions have made contact with your pet's skin, the veterinarian may wash and dry her thoroughly. In some cases, the vet may also encourage throwing up to remove all traces of the toxic onion. A cat may require intravenous fluids in order to prevention dehydration. The vet may also conduct blood testing in order to determine whether or not anemia is a problem. If the toxicity is especially serious in your pet, a blood transfusion may come into play.